Gobies are small fishes varying in size between 2 and 20 cm. They belong to one of the largest fish families, the Gobiidae comprising more than 2,000 species in more than 200 genera. Best known is the subfamily of Gobiinae, also known as the true gobies*, that contains more than 60 genera and 1120 species (note that the biological hierarchy spreads from: family→ subfamily →genus →species). As such, gobies are a good example of the amazing variety in adaptations of some fish species to its environment. Most gobies have a large head and eyes, two dorsal fins, large pectoral fins, and pouting cheeks. They have an elongated transparent or coloured body with scales, often covered with bands or patches. Most species have fused pelvic fins that form a disc-shaped sucker (somewhat like the dorsal suckers of remoras). 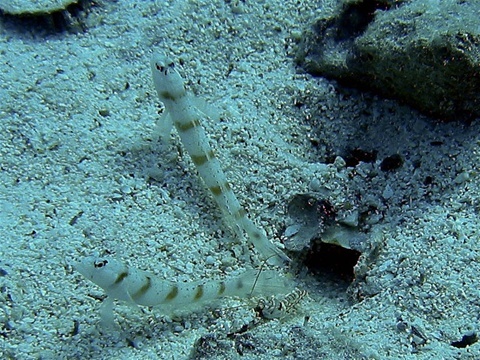 The goby uses it to attach itself to rocks or coral branches. Gobies are found everywhere over the world in tropical and temperate, brackish and freshwater environments. Most species seem to prefer shallow habitats like tide pools, coral reefs, mangrove swamps (like the mud jumpers) and sea grass floors. A special genus from the subfamily of Gobiinae is Bryaninops, or sea whip (or whip-coral) goby from the tropical Indo-Pacific waters. This genus can be split up in 16 species one of which is Bryaninops yongei. This species uses gorgonians and black coral as its host (Cirrhipathes anguina). The whip coral goby has a semi-transparent head and body and it spawns on its host, the gorgonian**. In the Red Sea the goby can sometimes be found peeping out of a hole in the Favites brain corals, a favorite target for macro photographers. Gobies usually live in male-female pairs. Many of them are bottom dwellers with habitats in the vicinity of a sandy bottom. Here there construct burrows (holes in the sand), using their mouths to dig into the sea bottom and by fanning away sand. The burrows are used as a hiding place as well as nests for spawning. The entrance of the burrows are blocked with small pieces of coral or rubbish. The goby also builds a mound (a small hill of sand) over the entrance of their burrow. Sometimes the burrow is shared with a little shrimp (see picture above, taken by Jan Derk in April 2004 in Koh Tao, Thailand). Initially male gobies are more active with maintaining the burrow. But after spawning the female takes over the maintenance, while males guard the eggs and provide them with oxygen by fanning water over them. Patzner, R.A.; Van Tassell, J.L. ; Kovačić, M.; Kapoor, B.G., eds. (2011). The Biology of Gobies. Enfield.